There have been many claims brought to my attention this week alleging the “final nail in the coffin” of anthropogenic global warming – the same nail that’s been fumbled around by deniers and the unfortunately misled for decades now. This time around it is the venerable and almost hilariously unreliable Daily Mail and it’s claims of Now it’s Global Cooling that has gotten so many hot under the collar. 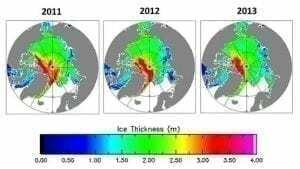 The tabloid claims that Arctic sea ice has rebounded by 60 percent, proving claims of diminishing arctic ice as false. What the Daily Mail is good at is frothing up emotions. What the Daily Mail is truly abysmal at is objective, fact-based reporting and explaining even the simplest of scientific details. Not that they’re interested in scientific details. “Regression to the mean“is a common statistical phenomenon that any extreme measurement – say a record-breaking seasonal Arctic ice minimum – is followed by a measurement closer to the average. 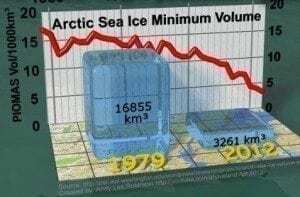 Yes, in fact, the seasonal Arctic sea ice minimum for 2012 was approximately 1 million square miles greater (less ice cover) than for the 2013 seasonal minimum (which officially hasn’t even occurred yet). The 2012 minimum was a record-breaker in a decade of record-breakers. That the overall trend for Arctic sea ice extent, as well thickness (as indicated in the graphic below), remains in steep decline is of little interest to the Daily Mail. What they are interested in is misleading their readers, not reporting the facts. There is no sudden return of Arctic sea ice cap, nor has there been any “emergency meeting” of the Intergovernmental Panel on Climate Change (IPCC) because of it – the Daily Mail made that up out of whole cloth. But alas, such publications will keep passing around that rusty nail, looking to pound it into the empty coffin of global warming. The rest of us face reality and look for solutions. Nice mis-use of regression to the mean. Your use of it in this situation is akin to me traveling from home and then, because I’m too far from home, automatically rebounding back towards home before continuing on. The fact is that the man-made global warming scam is falling apart, and thousands of credible climate and atmospheric scientists (not in the pockets of “big oil”) are now coming on board with this fact. Thanks Mark. You’re wrong on both counts, of course. The first comment re: regression to the mean is pretty amusing though. Keep whistling in the dark.